Common wisdom in the astronomy circles is that Vox Charta represents the biased view of the astronomy community which is focused towards extragalactic topics. Let’s see how much truth is in that statement. Papers that contain keywords connected with galaxies and cosmology seem to indeed to be upvoted more often then papers connected with other fields. The dashed line is 1:1 correspondence and we would expect the points to be on this line. 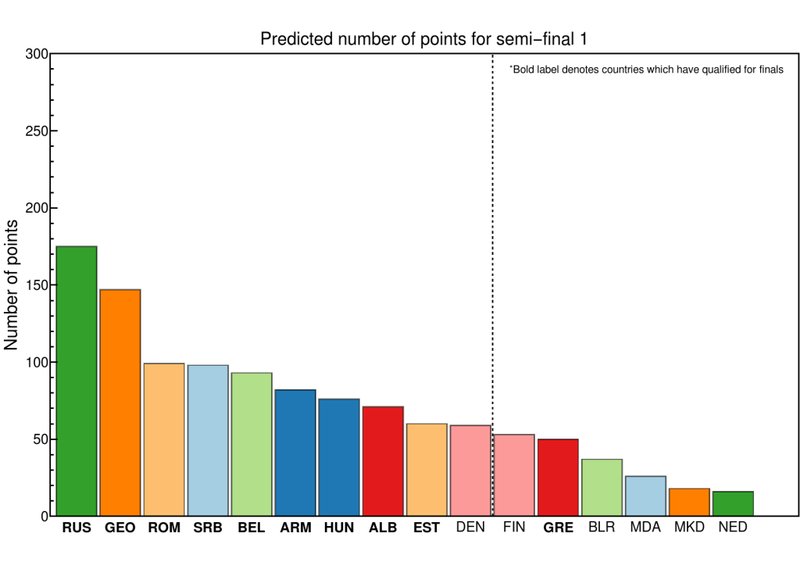 Points which are above are more upvoted (have larger share of Vox Charta votes then one would expect from their numbers), while points which are below the line are underrepresented on the Vox Charta. 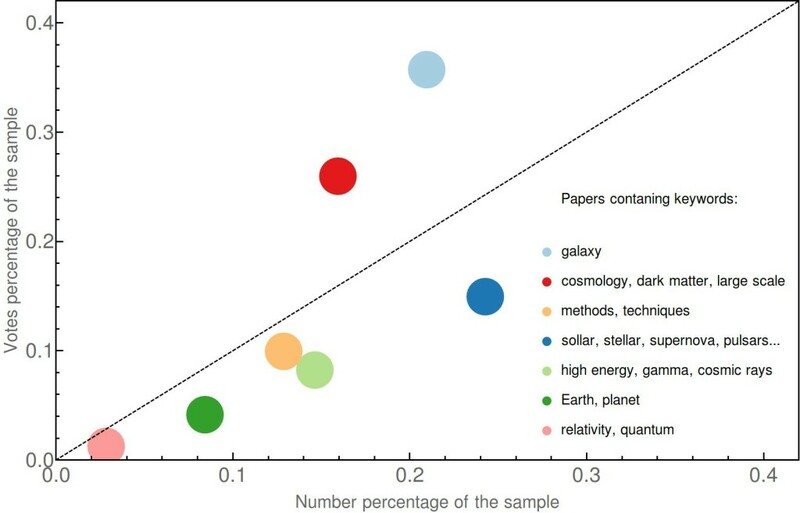 For instance we see that papers with stellar keywords received less then half of the votes received by the galaxy papers. 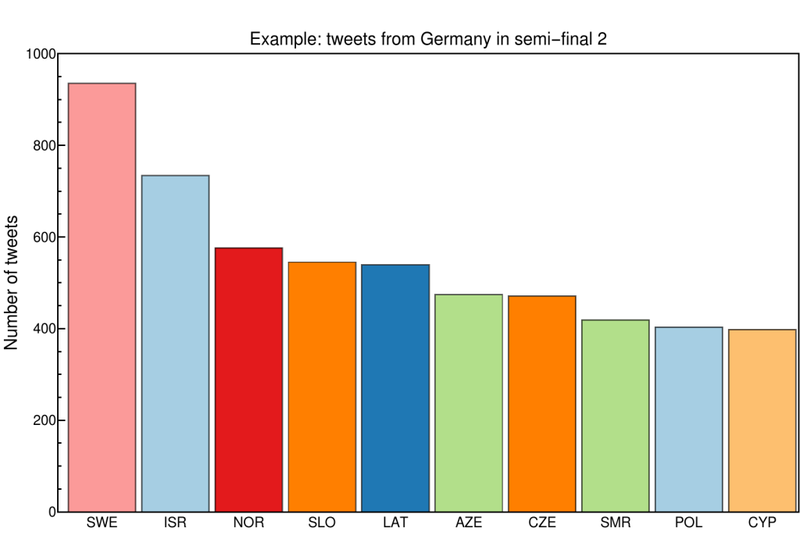 The different way to convey very similar information is shown in the Figure above, showing cumulative distribution functions. 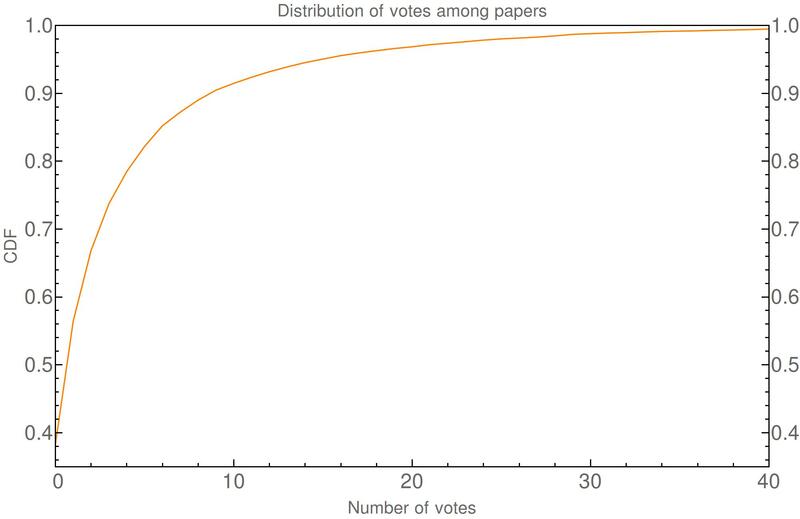 Lines which are close to the top of the Figure denote low number of votes (large number of papers receiving few votes), while galaxy and cosmology papers are obviously receiving larger number of votes all around. 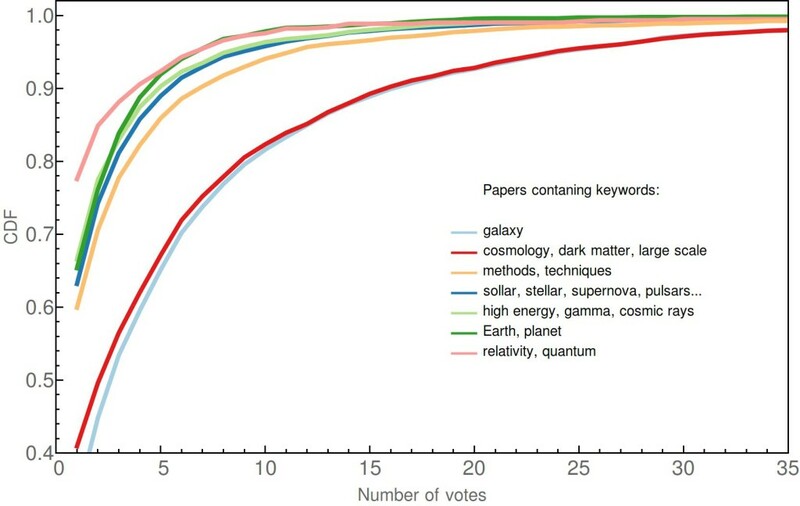 50% of the papers containing galaxy or cosmology keywords will have at least one vote. We can see that almost all of the most upvoted papers (25+) will be concerning galaxy and cosmology topics. Ok, so if you life goal is for your papers to have many Vox Charta votes, you bettwer work in the extragalactic topics. 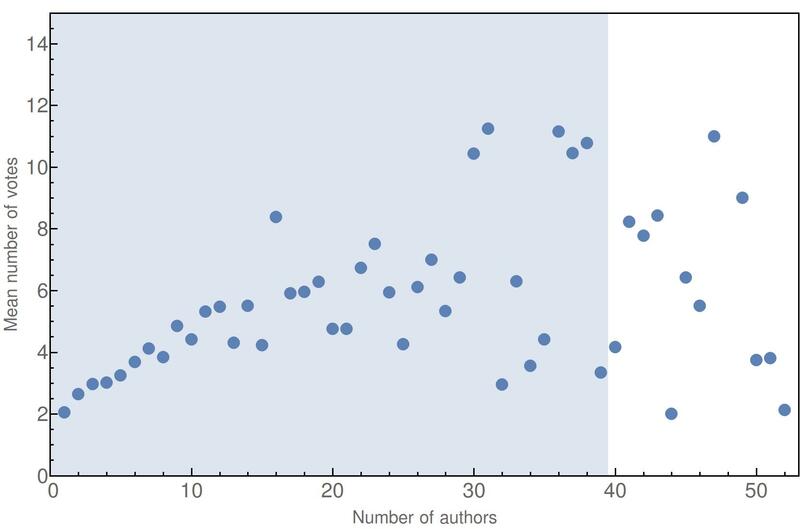 It also seems that is beneficial to have many authors on your papers, as seen on the Figure above which shows correlation between number of votes and number of authors on the paper. I have dashed the area where there are more then 10 paper per one point. Beyond that, there are only very few papers in each bin so any statistical statements are pretty weak. 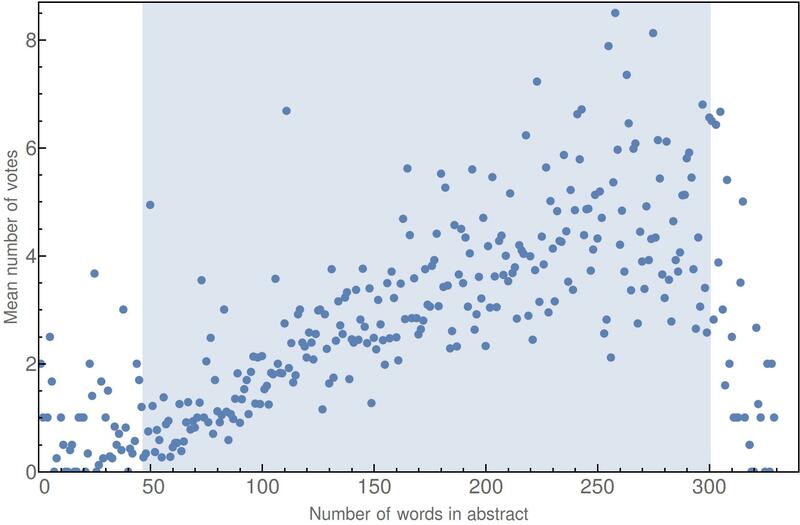 It also seems it is good to write longer abstract, hopefully because authors have a lot of smart thing to say. 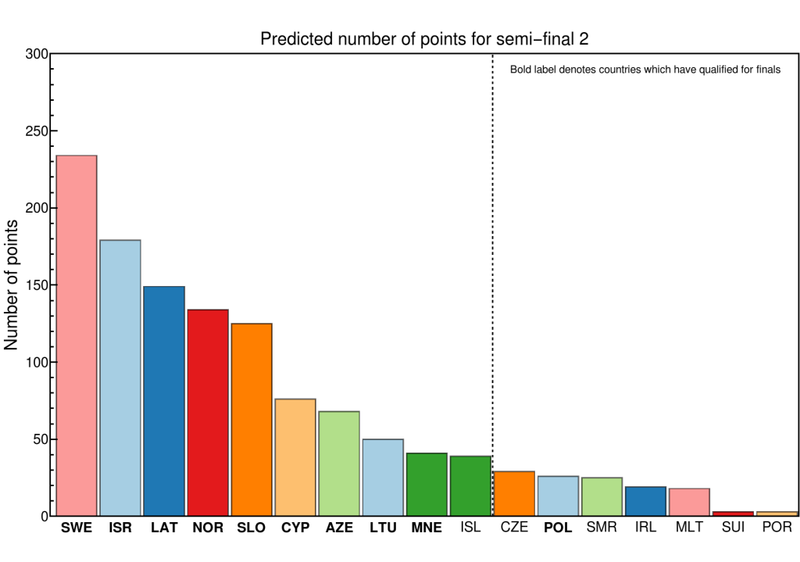 As before, dashed shows area where there are more then 10 papers per point. There seems to be increase to around 250 words (abstract limit for many papers) after which there is stabilization trend and possible decline. 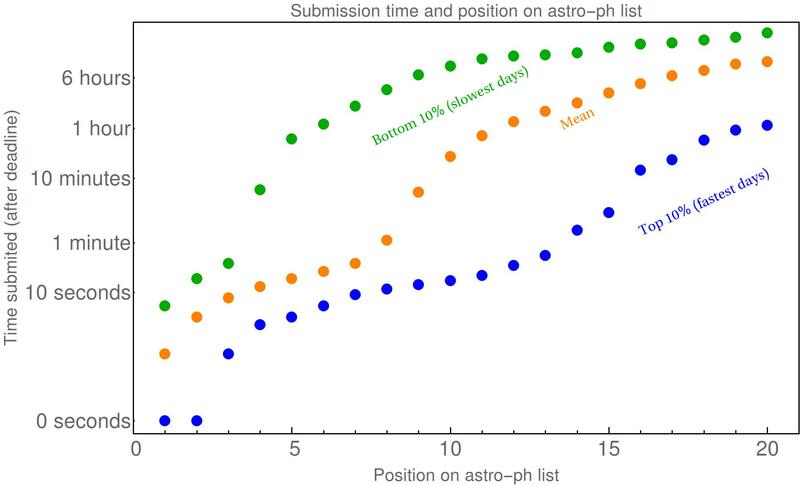 So, summarizing our conclusions from the first post and this one, to get a lot of votes, work in extragalactic topics, submit your paper so it on top of astro-ph list (competition is lowest on Tuesday), get a lot of co-authors and write long abstracts (possibly also do good science, but this is only based on anecdotal evidence). Vox Charta has over last few years become one of more prominent tools in every astronomers arsenal. For those who might be unfamiliar with the concepts like Vox Charta and arXiv, very shortly, on Vox Charta website members of the participating academic institutions can “upvote” or “downvote” papers that have appeared on the Internet (arXiv). Idea is that people will upvote papers that they found interesting and want to talk about on the next discussion session in the department. 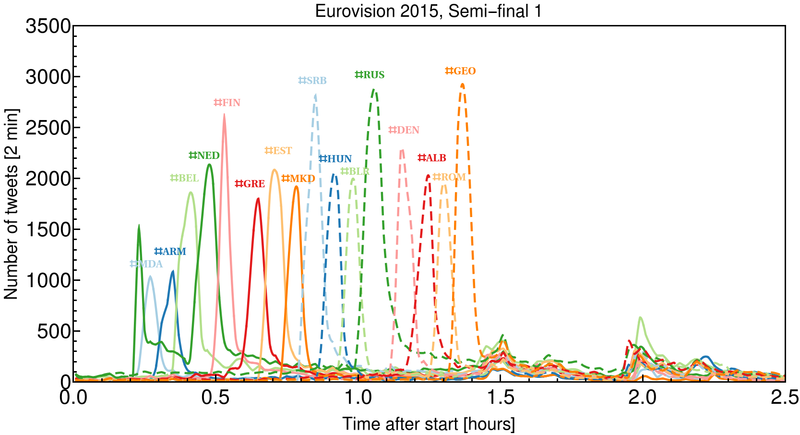 Everybody can see how many votes a paper has received and one can easily see which papers are “hottest” i.e. which have spurred most interest in the astro community. 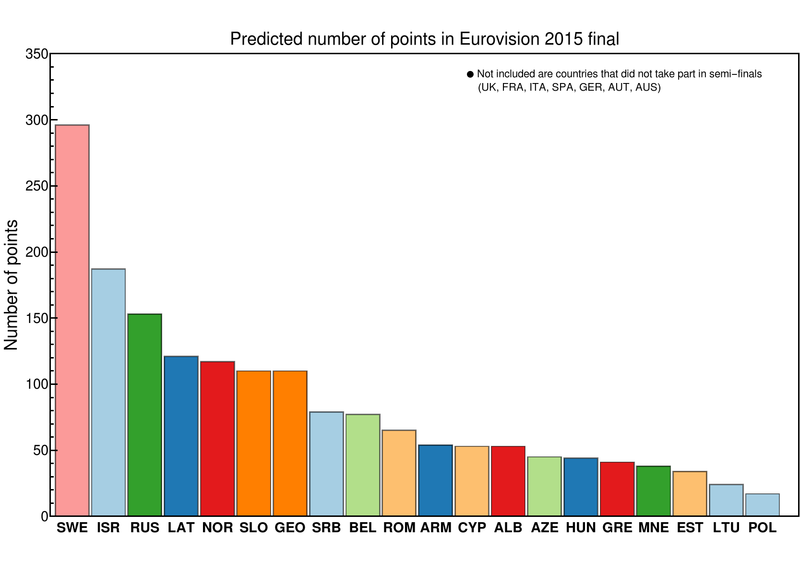 Let’s see how does the number of votes on Vox Charta in the 2014 correlate with some other parameters! 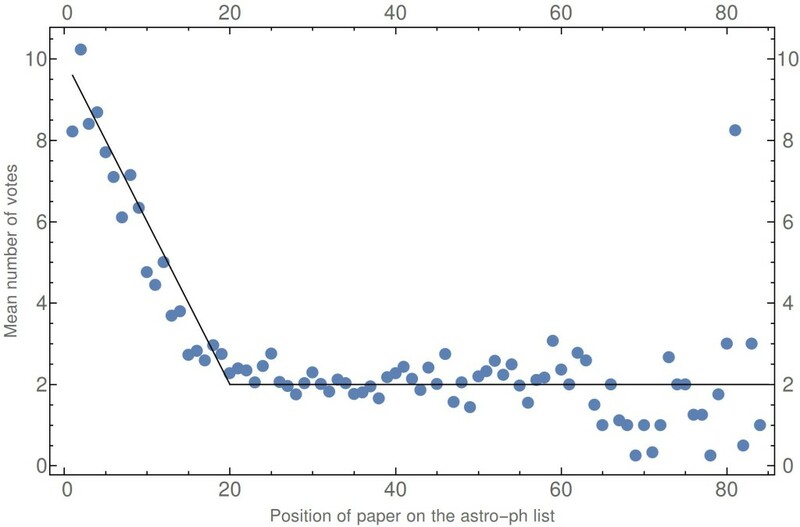 Above we see that publication position of the paper strongly correlates with the number of votes above position 20 on the arXiv list (Lines show poor broken power-law fit to the data, done with “eyeballing” method). Below position 20 trends seems to stabilize. Scatter increases at very high numbers simply because there are very few days when 60+ papers are published. Interestingly, first position does not mean also the largest number of votes. 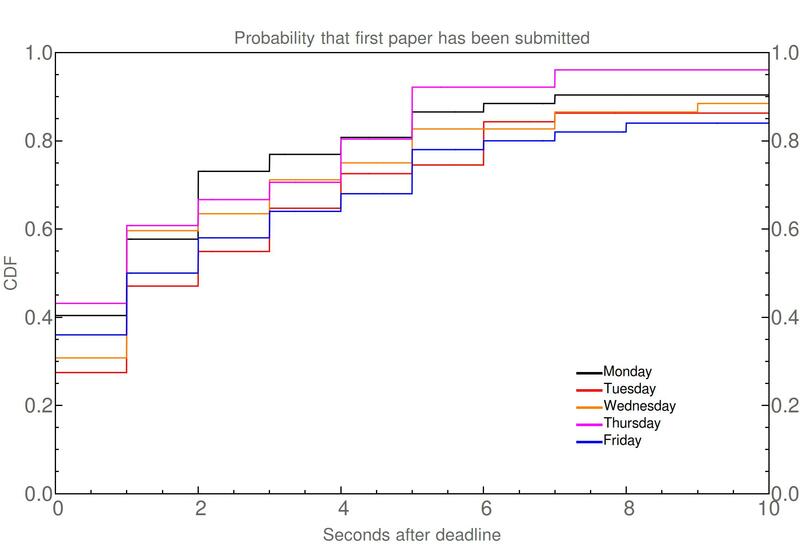 It is important to note that there is significant number of papers that tend to be first on the list but were not actually first ones to be submitted after the deadline; they were usually submitted day or so before and I assume that there was some problem which caused them to be published with delay through moderator action. 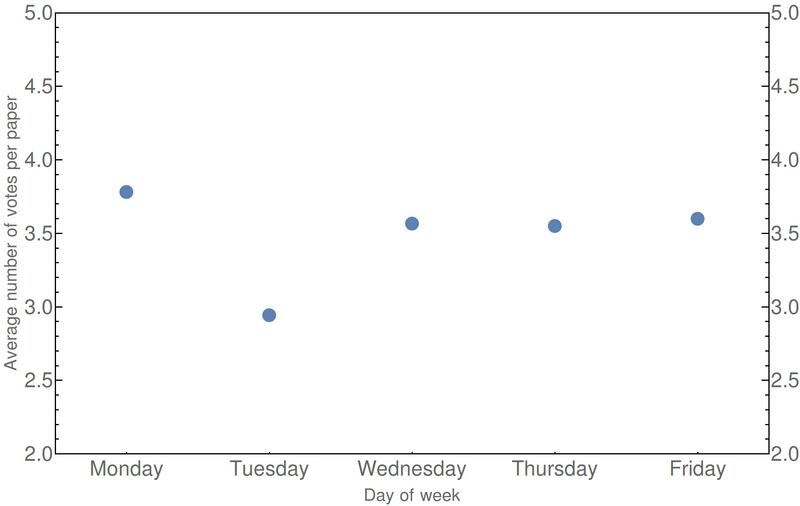 Different days of the week spur different number of votes. Day with most activity seems to be Wednesday and the slowest day is Monday. It also seems that astrophysicists like to upvote papers more in the middle of the week. Even thought there is some difference it is only at about 20% level. 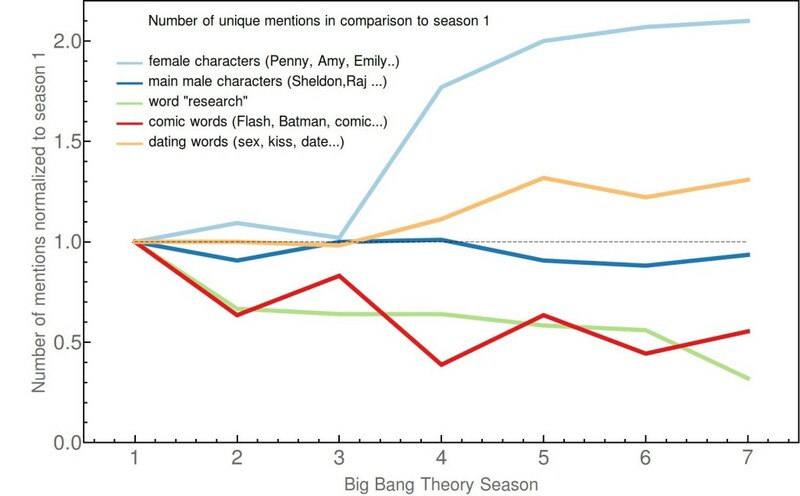 This difference is largely driven by the number of papers that are published each day. 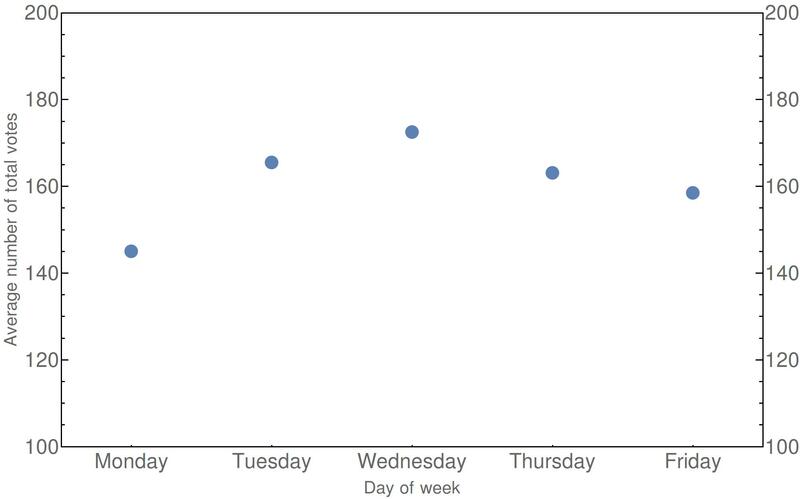 Papers published on Tuesday seem to be having lowest number of votes and Tuesday also seems to be only significant outlier. Distribution of votes is highly non-uniform. 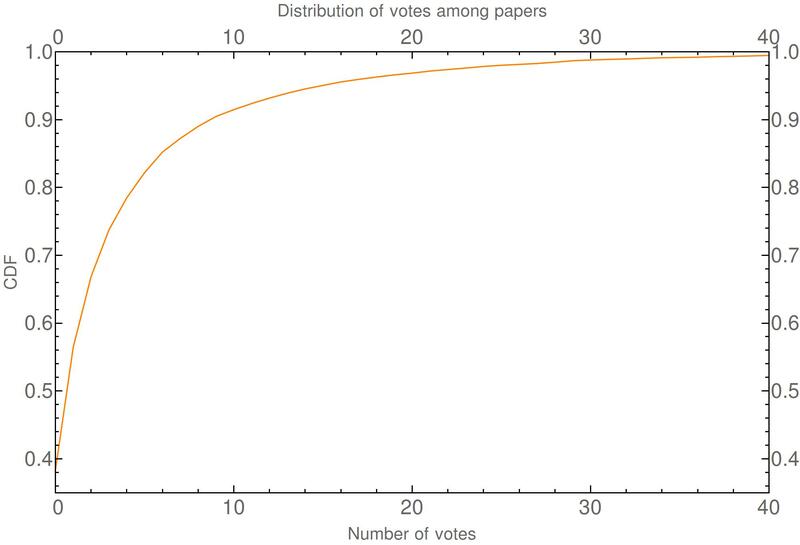 In plot above, we show cumulative distribution of votes that papers receive. So, for instance one can see that almost 40% of papers receive no votes, and around 80% of papers receive 5 or less. Having 10 votes is already being in the top 10%, while cca 18 votes are needed to break top 5%. 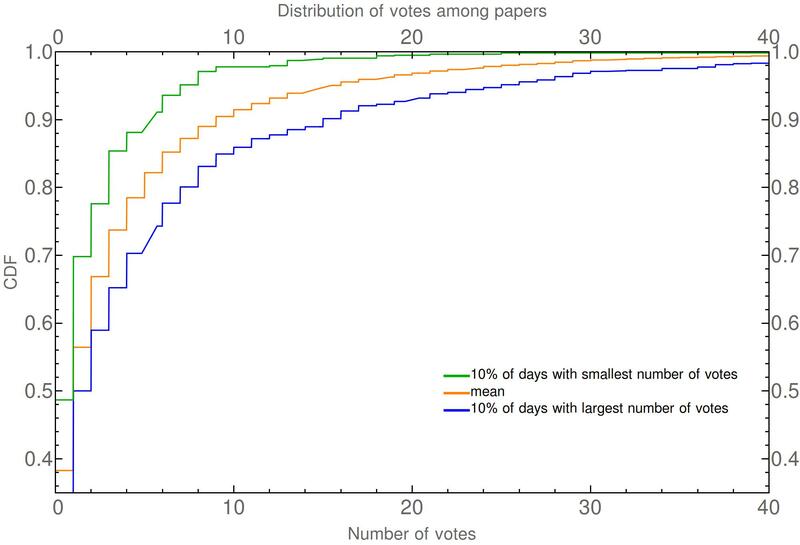 Ok, so if one wants to be on the top of the arXiv list and (perhaps) have a better chance of getting more votes, how quickly should should the paper be submitted? We show three lines which show different speeds of filling up. 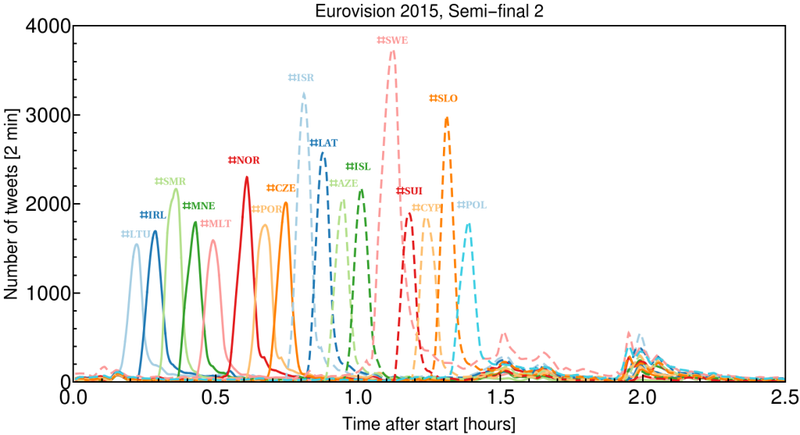 In blue, results are shown for 10% days which have reached 20 papers submitted the quickest. In orange mean is shown and in green we show results for slowest 10% of days. On average, submitting in around 20 seconds after deadline will secure one of first five positions. After initial rush is over in cca 1 minute, things slow down considerably. Ok, so you want to be first on the list. How quick do you have to be to succeed in that mission? 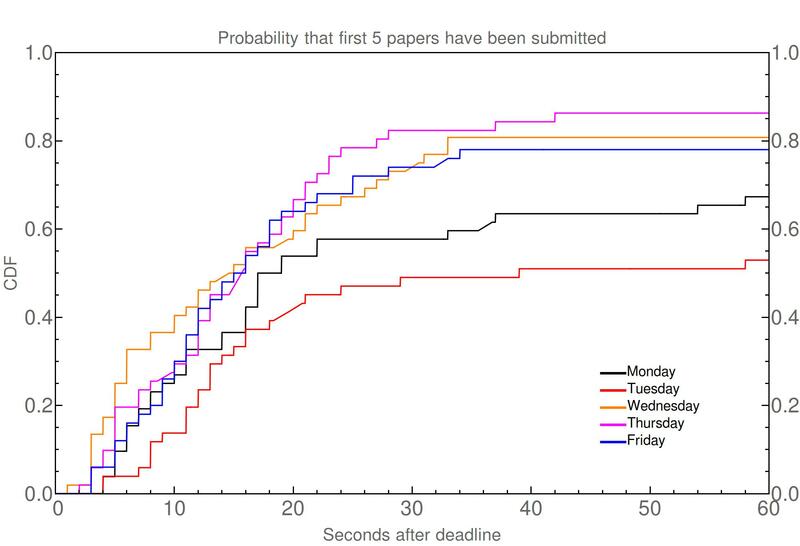 Data shows that in order to have 50% probability of success paper has to be registered by arXive in the first second and this has no strong dependence on the day of the week when the paper is published. This does not take into account the before mentioned effect, that even if you submit first you might not get first place, because of moderator’s action. Being in top 5 is somewhat easier and shows stronger day dependence As one can see above, submitting within first 20 seconds should place the paper in the first 5 positions. Competition is much weaker for Monday and Tuesday submissions then for other days of the week.